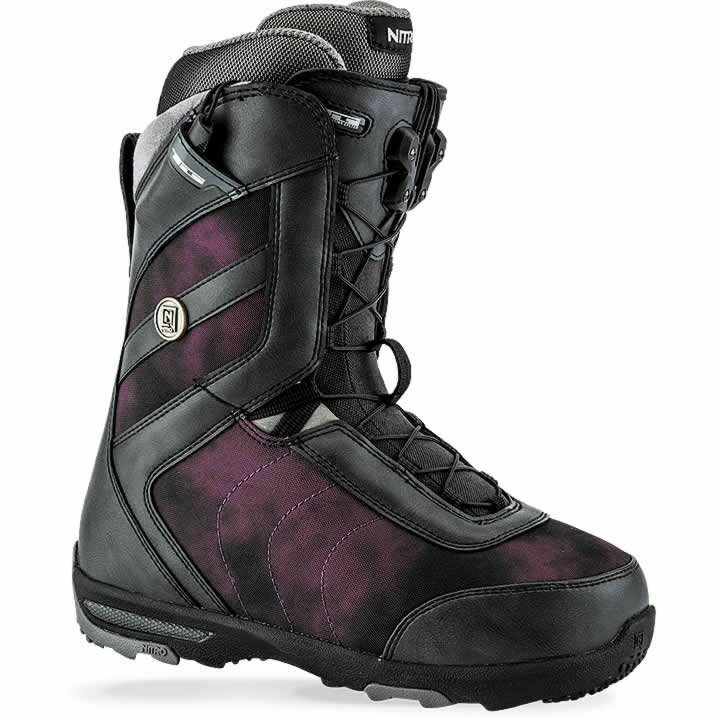 The women's Nitro The Monarch TLS Snowboard Boots are a perfect example of functional fashion, built for all day comfort and support while charging the entire mountain with confidence. Getting in and out of these toasty boots is easier than ever with Nitro's convenient TLS 5 Twin Lacing System, Bail Out System, and their new RE/LACE Liner Locker. It will only take you 30 seconds to put them on and off! Fully loaded, it is packed with a perfect mix of time-proven technology, Rubber/EVA Outsole, women's Cloud 3 Liner, and Anatomical Footbed, to give you the foothold, comfort, and warmth for daily progression. Developed and tested to keep your feet warm and dry in the most challenging conditions. Response 4/10 - This is basically your boot's stiffness. The higher the number, the stiffer - and therefore more responsive and carveable - your boot will feel. Freedom 6/10 - This shows how flexible boot is in both medial and lateral directions. A higher number means more tweaks! Comfort 8/10 - Higher numbers here refer to more plush and cush in lining, footbed and outsole. But also a softer boot is more comfortable automatically. Women's Cloud 3 Liner - Nitro's Cloud Liners are constructed from Thermacell material, using Nitro specific casts and their signature Latex Heel Pads. This ensures long lasting fit and comfort without fatigue. While this is not necessary, all Nitro's liners can be thermo-molded for an even more custom fit. RE/LACE Line Locker - Another innovation from your friendly developers at Nitro: The RE/LACE Liner Locker provides easy adjustability of your inner boot lacing when your boot shell is already tightened (tied), by just pulling up on the lace handle. This allows you to (re)tighten your liner and foothold throughout the day (on and off the chairlift) without having to untie you boot.